Many People asks, Do phones give off harmful radiation? Yes, and the exposure to their radiation, increase the risk of cancer, tumors or any other harmful disease etc. Considering the recent reports, it is found that there are more than 10 models emitting the Highest Radiation levels, are from Xiaomi, OnePlus, Apple and Google. 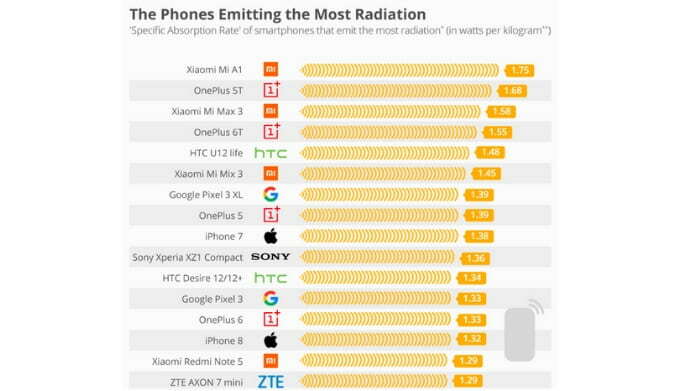 Among these smartphones, Xiaomi Mi A1 is found to emit the most radiation with a specific absorption rate of 1.74 watts per kilogram. Though, Xiaomi states that they follow the SAR levels and sold all of its smartphones in India according to the laws for SAR values. Xiaomi dominates in the list of these Highest Radiation levels smartphones. Whereas, Samsung Galaxy Note 8 emits the lowest radiation levels. Other Xiaomi smartphones are Mi Max 3, Mi Mix 3 and Redmi Note 5. Being a consumer, be aware of these radiations, they can be left a major effect on you. Nowadays, Smartphones have become a very essential part of our lives, we complete our half of work with it and when new technologies have arrived we switch to a new phone and so on. But, now it is a matter of concern. According to a new study, the German Federal Office for Radiation Protection has been found that some of the most popular smartphones including Xiaomi Mi A1, OnePlus 5T, OnePlus 6T and more emit the highest level of radiations as well. Where OnePlus 5T ranks second with SAR value at 1.68 watts per kilogram. Well, the list does not end here, OnePlus 6T, HTC U12 Life, Google Pixel 3 XL, OnePlus 5, iPhone 7, Sony Xperia XZ1 Compact, Google Pixel 3, iPhone 8 and ZTE Axon 7 mini among others. Moreover, we can check the SAR value, which is within the device. Whereas, some companies don’t provide SAR information. For Xiaomi users, check the SAR value of their smartphones by going to Settings > About phone > Legal Information > RF exposure information. For iPhones, go to Settings > General > Legal > RF exposure.